There is something incongruous about carpenters as symbols of death. Except that some of them build coffins, they ought to represent Life and Hope and Home. Yet I’ve been intrigued by a couple of stories about phantom carpenters: one who menaced a gravely ill woman and another who always appeared just before a death. It was delightful to add one more phantom carpenter to the list—this time an old woman with a bag of tools, in this grim story from Augustus Hare. “It was Lady Ashburton’s brother, Stewart Mackenzie, who had that strange adventure at school. He was in bed in a long dormitory, with the boys in rows of beds on each side. In the night he awoke, and saw a little old woman come into the room, dressed in a peaked hat, and round her neck was slung a sort of satchel filled with carpenter’s instruments—a mallet, chisel, hammer, nails, &c. He saw her go up to one of the sleeping boys, look at him, bend over him, examine him very carefully, and then take out a nail, seize the hammer, and seem about to knock the nail into his forehead: then suddenly, just at the last moment, to change her mind and pass on. Into the foreheads of some of the boys she seemed to strike a nail, some she passed by altogether: into others she seemed to intend to strike the nail, and then to change her mind. Finally, with horror, he felt her approaching his own bed: she took out a nail, seemed coming near to strike it, then suddenly passed on. In the morning young Mackenzie was very ill, very feverish, and said, ‘Oh, I have had such a dreadful dream,’ and he told what he had seen. The master said, ‘Can you remember which the boys were into whose foreheads she struck the nail?’—’Oh certainly, I can perfectly,’ and the master wrote down the names in a pocket-book. Very soon after a terrible fever broke out in the school. All those boys died. The boys the old woman looked at and finally turned away from, had the fever, but recovered: the boys she passed by altogether escaped entirely. There seems to be a little confusion about who experienced this nocturnal horror. Other sources say the young witness was Francis Humberston Mackenzie, later Lord Mackenzie of Kintail and Baron Seaforth, and that he was left “stone-deaf” by the fever. The minister of Elfdale declared, that one night these witches were, to his thinking, on the crown of his head; and that from thence he had a long continued pain of the head. 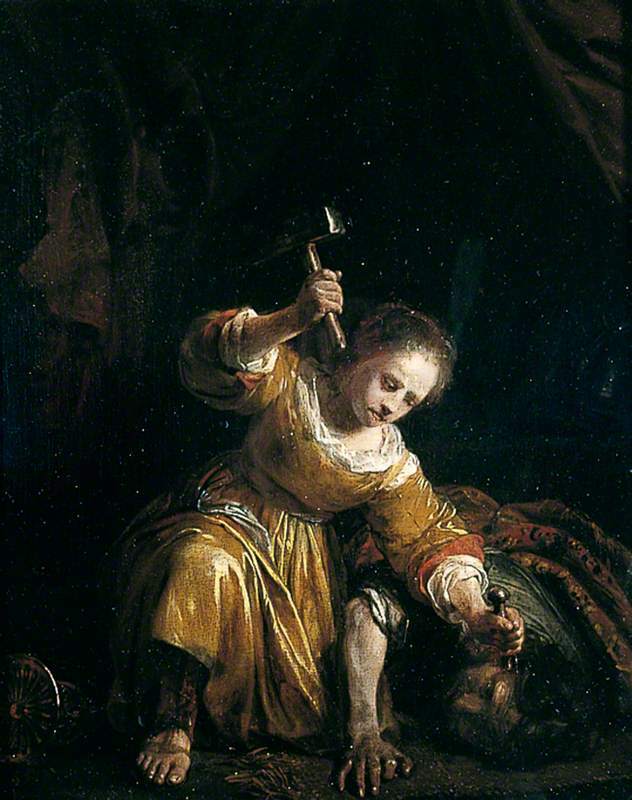 One of the witches confessed, that the devil had sent her to torment that minister; and that she was ordered to use a nail, and strike it into his head, but it would not enter very deep, and hence came that head-ach. The minister said also, that one night he felt a pain, as if he were torn with an instrument that they cleanse flax with, or a flax-comb; and when he awaked, he heard some body scratching and scraping at the window, but could see no body; and one of the witches confessed, that she was the person that did it, being sent by the devil. The minister of Mohra declared also, that one night one of these witches came into his house, and did so violently take him by the throat, that he thought he should have been choaked, and awaking, he saw the person that did it, but could not know her; and that for some weeks he was not able to speak or perform divine service. An old woman of Elfdale confessed, that the devil had helped her to make a nail which she struck into a boy’s knee, of which stroke the boy remained lame a long time. And she added, that before she was burned, or executed by the hand of justice, the boy would recover. When Dr. Donne, afterwards Dean of St. Paul’s, took possession of the first living he ever had, he walked into the church-yard, where the sexton was digging a grave, and throwing up a skull, the doctor took it up to contemplate thereon, and found a small sprig or headless nail sticking in the temple, which he drew out secretly, and wrapt it up in the corner of his handkerchief. He then demanded of the grave digger, whether he knew whose skull that was: he said he did very well, declaring it was a man’s who kept a brandy shop; an honest drunken fellow, who, one night having taken two quarts of that comfortable creature, was found dead in his bed next morning, –Had he a wife?—Yes.—What character does she bear? —A very good one: only the neighbours reflect on her because she married the day after her husband was buried. This was enough for the doctor, who, under the pretence of visiting his parishioners, called on her. He asked her several questions, and, among others, what sickness her husband died of. She giving him the same account, he suddenly opened the handkerchief, and cried in an authoritative voice, Woman, do you know this nail? She was struck with horror at the unexpected demand, and instantly owned the fact.